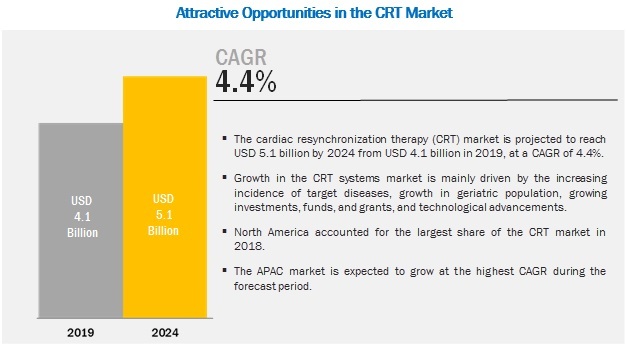 [107 Pages Report] The cardiac resynchronization therapy (CRT) systems market is projected to reach USD 5.1 billion by 2024 from USD 4.1 billion in 2019, at a CAGR of 4.4%. The growth of the CRT market is majorly driven by the increasing incidence of target diseases (primarily due to the rising geriatric population). Rising investments and support, along with technological advancements, are also contributing to the growth of this market. 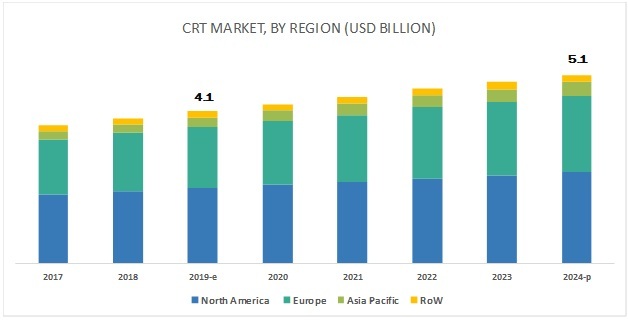 The Asia Pacific region is projected to register the highest growth rate in the CRT systems market during the forecast period. Favorable reimbursement scenario in Japan, the rising geriatric population in China, rising incidence of CVDs, improving healthcare infrastructure, growing middle-class population, and rising disposable income levels in India are some of the key factors driving the growth of the CRT systems market in the Asia Pacific. Prominent players in the CRT systems market are Medtronic (Ireland), Abbott (US), Boston Scientific Corporation (US), MicroPort Scientific Corporation (China), BIOTRONIK (Germany), and Medico S.p.A. (Italy). Medtronic is a medical technology company that manufactures, designs, develops, and markets a wide range of solutions and medical devices used in the treatment of cardiac, spinal, neurological, vascular, and chronic conditions. The company is one of the major players in the CRT systems market. With a strong brand name and wide geographic coverage in more than 160 countries, Medtronic has a well-established presence in this market. As a part of its global growth strategy, the company pursues organic growth strategies, such as product approvals. The company is also investing a large sum into its expansion projects to increase its global presence. In this regard, the company opened its Asia Pacific headquarters in Singapore to support operations at 80 locations in this region. In 2017, the company received the US FDA approval for its quadripolar cardiac resynchronization therapy pacemakers (CRT-Ps), which improve therapy delivery for patients with heart failure. In 2017, the company also received the CE mark approval for a suite of quadripolar cardiac resynchronization therapy pacemakers (CRT-Ps). How will the current technological trends affect the CRT systems market in the long term? How is the CRT- pacemakers market growing? Which regions are likely to grow at the highest CAGR? What are the challenges hindering the adoption of CRT devices? What are the growth strategies being implemented by major market players? The secondary research process involves the widespread use of secondary sources, directories, databases (such as Bloomberg Businessweek, Factiva, and D&B Hoovers), white papers, annual reports, companies house documents, investor presentations, and SEC filings of companies. Secondary research was used to identify and collect information useful for the extensive, technical, market-oriented, and commercial study of the CRT market. It was also used to obtain important information about the key players and market classification & segmentation according to industry trends to the bottom-most level, and key developments related to market and technology perspectives. A database of the key industry leaders was also prepared using secondary research. In the primary research process, various sources from both the supply and demand sides were interviewed to obtain qualitative and quantitative information for this report. The primary sources from the supply side include industry experts such as CEOs, vice presidents, marketing and sales directors, technology & innovation directors, and related key executives from various key companies and organizations operating in the CRT market. The primary sources from the demand side included industry experts, such as researchers and scientists, and industry experts from pharmaceutical & biotechnology companies. Primary research was conducted to validate the market segmentation, identify key players in the market, and gather insights on key industry trends & key market dynamics. The market size estimates and forecasts provided in this study are derived through a mix of the bottom-up approach (segmental analysis of major segments) and top-down approach (assessment of utilization/adoption/penetration trends, by product type, end user, and region). After arriving at the market size, the CRT market was divided into several segments and subsegments. To complete the overall market engineering process and arrive at the exact statistics for all segments & subsegments, the data triangulation and market breakdown procedures were employed, wherever applicable. To define, describe, segment, and forecast the global CRT market by product type, end user, and region.